Update: slight changes made in response to legal threat from Alisher Usmanov's lawyers, Schillings. I always thought it was vaguely appropriate that one of Russia's robber barons, Roman Abramovich, had taken over Chelsea, that most middle class constituency in the whole country. 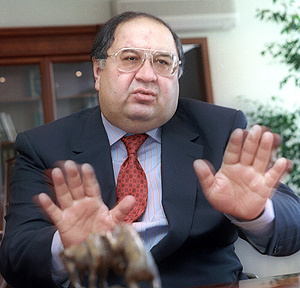 Quite what the asparagus munching, bruschetta lovers of Islington would make of Alisher Usmanov, described in strident terms by Craig Murray here, is another matter. As an Arsenal fan, I'd much rather that we finish 4th every season than become the next club to be taken over by the latest foreign businessman flush with cash made from allegedly dubious sources. It's quite true that football's always been a corrupt game, as one of our previous managers showed. It's quite another for football clubs to become the latest playthings for the disgustingly rich, plowing money into them simply because they can, or as you suspect with the Glazer family's takeover of Manchester United, to in the end make even more. There was a good reason why in the cases of both United and Wimbledon, now the horrid MK Dons, that the fans rightly felt their clubs had been taken from them, just the latest machinations of global capitalism, to be bought, sold and used like an exceptionally successful whore. It's always come down to how hungry the fans are for success: Thaksin Shinawatra's takeover of Manchester City was welcomed purely because of how wretched City's recent history has been, no matter how corrupt or deadly his business dealings or crackdowns on drug trafficking were while he was Thailand's prime minister. As for Arsenal, although the last couple of seasons have been more challenging than previously, almost purely because of the money being pumped into both Man Utd, Chelsea and now Liverpool, we're the only club able to boast about going a whole Premiership season without losing a game. Our football is still majestic, the beautiful game as it ought to be played, even if we concentrate more on looking pretty than shooting at times. We have success, more is likely to come, as long as we keep Mr Wenger; what more do we want? If this wonderful-sounding guy takes over, would you start up your own club, a la, AFC Wimbledon or FC United? Well, hopefully it's not going to come to that, as the board seems to be opposed outright still to any potential takeover at the moment. Any bid is also likely to still involve Stan Kroenke, which would lesser the blow slightly. I'm not in any position to get involved in any such setting up, but if it happens it'll give me pause for thought. All these excellent post recently, and it's the one about bloody football that gets the comments. "Our football is still majestic, the beautiful game as it ought to be played"
This is a joke ... is't it ? Mike Jackson's written a book! 10 years of turning in the grave. Scum-watch: Keeping the explicit images at bay. Comedy moment of the day. Scrabbling over the bodies for political gain. When a picture says more than thousands of words. More reasons to love Jeremy Paxman.